Lei Xu, Jian-Ming Feng, Jia-Xin Li, Jin-Mei Zhu, Lin-Jiang Tong, Shan-Shan Song, Yi Chen, Fu-Lin Lian, Ya-Ping Li*, Dong-Hai Lin, Jian Ding, Ze-Hong Miao*. Tanshinone-1 induces tumor cell killing, enhanced by inhibition of secondary activation of signaling networks. Cell Death Dis. 2013;4:e905. 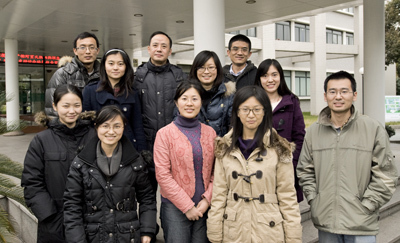 Stefano Giustino Manzo, Zhao-Li Zhou, Ying-Qing Wang, Jessica Marinello, Jin-Xue He, Yuan-Chao Li, Jian Ding, Giovanni Capranico*, Ze-Hong Miao*. CDK7 mediates degradation of RNA polymerase II induced by triptolide. Cancer Res. 2012;72:5363-5373. Zhao-Li Zhou, Ya-Xi Yang, Jian Ding, Yuan-Chao Li*, Ze-Hong Miao*. Triptolide: structural modifications, structure-activity relationships, bioactivities, clinical development and mechanisms. Nat Prod Rep. 2012; 29: 457-475. Bing Yu, Mei-Hong Li, Wei Wang, Ying-Qing Wang, Yi Jiang, Sheng-Ping Yang, Jian-Min Yue, Jian Ding*, Ze-Hong Miao*. Pseudolaric acid B-driven phosphorylation of c-Jun impairs its role in stabilizing HIF-1alpha: a novel function-converter model. J Mol Med (Berl). 2012; 90:971–981. Bing Yu, Ze-Hong Miao*, Yi Jiang, Mei-Hong Li, Na Yang, Ting Li, Jian Ding*. c-Jun protects HIF-1? ?from degradation via its Oxygen-Dependent-Degradation domain in a non-transcriptional manner. Cancer Res. 2009; 69:7704-7712. Ze-Hong Miao, Audrey Player, Uma Shankavaram, Yong-Hong Wang, Drazen Zimonjic, PhilipLorenzi，Zhi-Yong Liao, Hong Liu，Tsutomu Shimura，Hong-Liang Zhang，Ling-Hua Meng, Yong-Wei Zhang，Ernest S. Kawasaki, Nicholas C. Popescu, Mirit I. Aladjem，David Goldstein, John Weinstein, and Yves Pommier. Non-Classical Functions of Human Topoisomerase I：Genomewide and Pharmacological Analyses. Cancer Res. 2007; 67:8752-61. Ze-Hong Miao, V. Ashutosh Rao, Keli Agama, Smitha Antony, Yves Pommier. 4-Nitroquinoline-1-oxide induces the formation of cellular Topoisomerase I-DNA cleavage complexes. Cancer Res. 2006; 66: 6540-6545. Ze-Hong Miao, Jian Ding. Transcription factor c-Jun activation represses mdr-1 gene expression. Cancer Res. 2003; 63: 4527-4532.